Annex Garden offers you the perfect home away from home. Each of our rooms and suites has its own story and varies in type to suit your needs. The Murray Room has special meaning as it is named for Monsignor Athol Murray (1982-1975), the son of an affluent Toronto family, and a salty priest of unshakeable faith who strongly believed in individual development through rigorous education and sport. Annex Garden was the Murray family home from 1905 to 1921 and commemorated on the historical plaque in the garden at the front of the house. 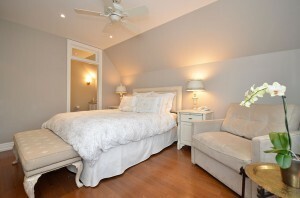 Our most luxurious B&B room offers exclusivity as the only guest room located on the second level. The Murray Room offers pillow top king bed (or two long twin beds), a fireside sitting area, and a desk and chair by the front window to work or read. A four piece beautifully appointed ensuite with air jet soaker tub will feel like your own spa! The walk in closet has the unique feature of a window and plenty of drawers and shelves to keep all your clothes and personal belongings. A comfortable love seat converts to a double bed if more accommodation is required. The sofabeds all have 5" plush mattresses - as comfortable as our beds. Like a breath of fresh air, the large private balcony located just off the ensuite, is equipped with a sun umbrella and patio set to sit and relax after breakfast or while enjoying a drink before dinner. Help yourself to the Beverage Centre located in your room and keep food and beverages cool in the convenient bar fridge. Complimentary Bottled Water & Perrier are chilling in the fridge. The Willan Room is named to commemorate Healey Willan (1880-1968), a famous Canadian composer and organist who spent many of his years as Precentor of the Church of St. Mary Magdalene located just behind his namesake park with his namesake up the street from Annex Garden. The Willan Room with its serene, creamy décor is our coziest room on the top floor of our historic home. You will sleep well on the pillow top queen bed. Enjoy the sitting area by the window with a picturesque view of the treetops, and the desk & chair to work or read. The cozy reading chair does double duty as a comfortable 80” single pullout bed. A four piece beautifully appointed ensuite with air jet soaker tub will feel like your own spa! Help yourself to the coffee/tea cart and bar fridge located just outside your suite door—it’s just for you! Complimentary Bottled Water & Perrier are chilling in the fridge. The Palmerston Suite is named for Palmerston Boulevard, just one block east of Annex Garden, and our neighbourhood Palmertone-Little Italy. Palmerston was named after Lord Palmerston (1784-1865), Prime Minister of the United Kingdom, it is said, to perhaps promote Victorian ideals to future Torontonians. 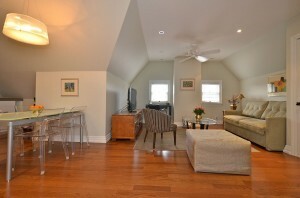 The Palmerston Suite is a spacious and bright 1 bedroom apartment on the third floor of our lovely historic home. It is beautifully furnished with an excellent queen pillow-top bed and a very comfortable queen sofabed. The sofabeds all have 5" plush mattresses - as comfortable as our beds. There is also a large Ottoman that converts to a full-length single bed. In addition to our basic amenities, The Palmerston comes with a fully equipped kitchen with dishwasher, fridge, stove, washer, dryer, microwave, toaster and coffee-maker and all the necessities to cook your own meals. There is a dining area as well as a large 4-piece bath with soaker tub. Stay in for a movie-night and enjoy the large flat screen TV and DVD player in the living room. There is also a second TV in the bedroom. Complimentary Bottled Water & Perrier are chilling in the fridge. The Visser Suite pays homage to Margaret Visser, celebrated Award-winning Canadian Author, Broadcaster and Lecturer. Among her many books on history and mythology of everyday life, Ms. Visser is also a food anthropologist. Margaret was instrumental in lobbying to build the Healey Willan Park just up the street from our home. An interesting fact: Your host previously owned a house up the street that Margaret Visser lived in. When it sold, Visser’s original kitchen was a selling feature. The Visser Suite, six steps down from the main level is bright with lots of windows. A private oasis (the only suite on this level), just down the hall from the fitness room. 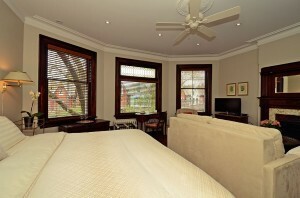 Perfect for a family of four, two couples or those who are in the city on business. You will enjoy this spacious suite complete with fully equipped kitchen with dishwasher, fridge, stove, microwave, toaster and coffee-maker and all the necessities to cook your own meals. There is a dining area as well as a large 4-piece bath with soaker tub. 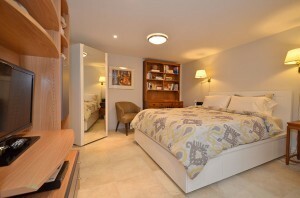 You will find a flat screen TV and DVD player in the living room with a second TV in the bedroom. Laundry access is only a few steps away. Complimentary Bottled Water & Perrier are chilling in the fridge.